Registration is now open. Please contact your District Chair if you would like to participate as a convention delegate. 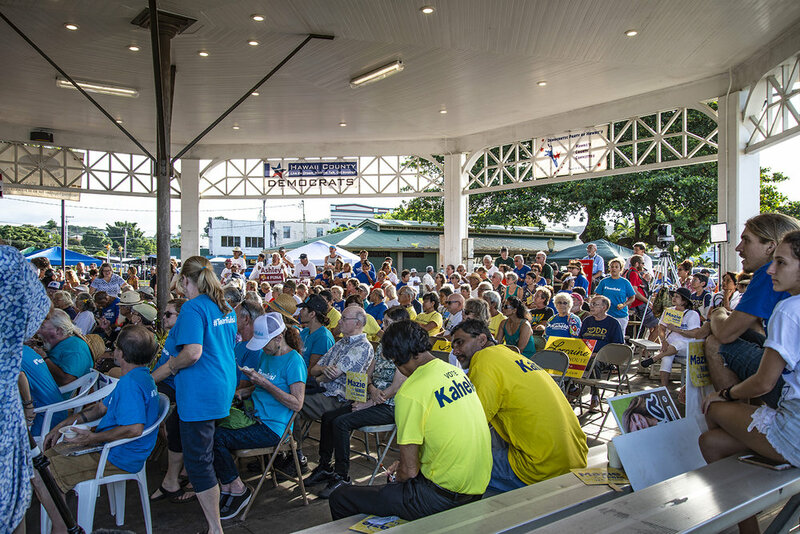 Democrats from all over the state gathered the night before the primary in the traditional Grand Rally in Hilo. All candidates running as Democrats in the 2018 primary election were invited to speak at this traditional gathering. Convention Delegates Cast Their Votes on Resolutions, Platform and Rules to be sent to the 2018 State Convention. The 2018 Hawai‘i County Democratic Party convention was held on Saturday April 28th from 8am-4pm at Sangha Hall in Hilo. Swag from the 2018 State Convention, held for the first time ever on Hawai'i Island. A historic convention! The 2018 Democratic Party of Hawai'i State Convention was held May 25th-27th, at the Hilton Waikoloa Resort. Officers from the Democratic Party of Hawai'i in attendance at the People's Climate March & Rally, organized by Parish & Coulter. The Hawai’i County Committee, Democratic Party of Hawai’i County’s leadership group, meets on a monthly basis to discuss party matters, along with legislative and community issues. All meetings are open to the public. Meeting locations alternate between the West Hawai’i Civic Center in Kailua-Kona, and the Hawaii County Equal Opportunity Council in Hilo. The Platform Committee would like to go forward with an actionable platform based on a specific legislative agenda. To do this, we need to tie our platform to specific progressive legislation that has been proposed for 2018-2019. This type of platform will allow us to use it to hold our State Democratic legislators accountable for their legislative actions & inaction. Help us to organize support for the legislative priorities that were passed by the party’s State Central Committee for the 2017 legislative session. In the article you will see the party’s priorities, how to track legislation, how to submit testimony, and how to network with others to achieve your goals. Right now, Democrats are working to protect historic reforms currently improving the lives of millions of Americans—and we're fighting to keep building a stronger future for this country. Supporters are mobilizing on the ground in all 50 states, rolling up their sleeves and getting to work to help support Democrats and the President's agenda. Together, we'll protect the progress we've made and keep this country moving forward—and that starts with your commitment, right now.